Musician M2 bounces back with another classic banger for all music lovers. The ‘Magic Camp’ musician starts his NEW YEAR EVE by sharing to his fans all round what I call another monster hit song dabbed ‘HOLD MY HANDS’, the song, which is a love song got M2 expressing his love to his special someone and in details the plans he has for the her. 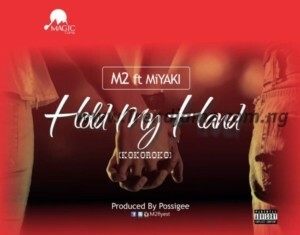 ‘HOLD MY HANDS” features ‘Vision Music Group’ first signee and undoubtly the ‘Youngest in Charge’ MiYAKi, the young star brought a different vibe to the song making it more interesting and nicer to listen to with his so refreshing and silky voice. Production credit to award winning producer and mixing master POSSI G.